Just a year after I moved to Bombay from Ratnagiri for my job, I fell in love with Minal. Her father was looking to get her married to a person from the same caste, but Minal loved me. So, one day, we decided to leave Mumbai unnoticed and get married in a temple in Ratnagiri. It was one of the happiest days of my life. When we returned to Mumbai with the news, her family stopped talking to her. But, we were very happy with each other. I worked as a supervisor for a construction company and my job was going good. We even rented a small home for ourselves and were buying things we needed like a fridge, T.V. and all the basics. Our needs were very ordinary and we were enjoying our lives. Then the best thing happened. We were blessed with a son. We couldn’t be any happier. I am with the woman I love and now, with a baby boy, I had a small happy family. Just when Vedant was 18 months old, Minal’s throat was acting strange and she started losing weight all of a sudden. I thought it was something very minor due to a cough but after running around to over 15 hospitals, we learned that Minal had blood cancer. We stayed strong. She underwent chemotherapy for almost all of 2017. I managed to spend all my savings and borrow money from various friends and acquaintances and get her treated. She started gaining her weight back and looking normal and she seemed perfectly healthy. That’s all that I cared for. But late November (2017), she started having a similar pain in her throat again. Again, we ran tests and then I got to know what I was afraid of knowing – she had relapsed. After the relapse, she has already been through 1 cycle of chemo. The doctors say that she needs 2 additional cycles followed by a Bone Marrow Transplant. Due to her condition, we were advised not to have our son live with us as either could develop some serious infections from the other. He is now in Ratnagiri, with my parents. Minal and I haven’t seen him for the past 14 months. Just like any loving parent, she just wants to see Vedant and be with him again, that’s literally all that she thinks about. I am dying to see him too. We just see him for a few minutes over a video call but that’s about it. Last year, I couldn’t really go to work for 8 months and again, this year, I’m unable to go for at least 6 months more. I don't have much left and I need to be by my wife. She’s like a role model. She’s so strong. I’m sure I wouldn’t be able to go through what she has. Despite all this, she’s still smiling around me and we do all the things together: like eat together, talk to each other like we always do and miss our son together. My parents are taking care of our 3-year-old in Ratnagiri and he’s just about to go to school. I don’t really speak to anyone about what my wife and I are going through because I feel like I’m wasting time there. No one has put me in such a situation, it just happened naturally. So, I don’t want to sit around but I want to try as hard as I can to save the woman I love. I’m always thinking about the next step in life and now, her second cycle of chemo will cost Rs. 1.5 lakh and I don’t really know how I’m going to pay for it. I still have to worry about the transplant and the whole thing is going to cost around Rs. 14 lakhs. I haven’t lost hope though, and I never will, she’s my life partner and I will work twice as hard to save her. I’m just 31 and my hands and legs are working just fine so I have no excuse. 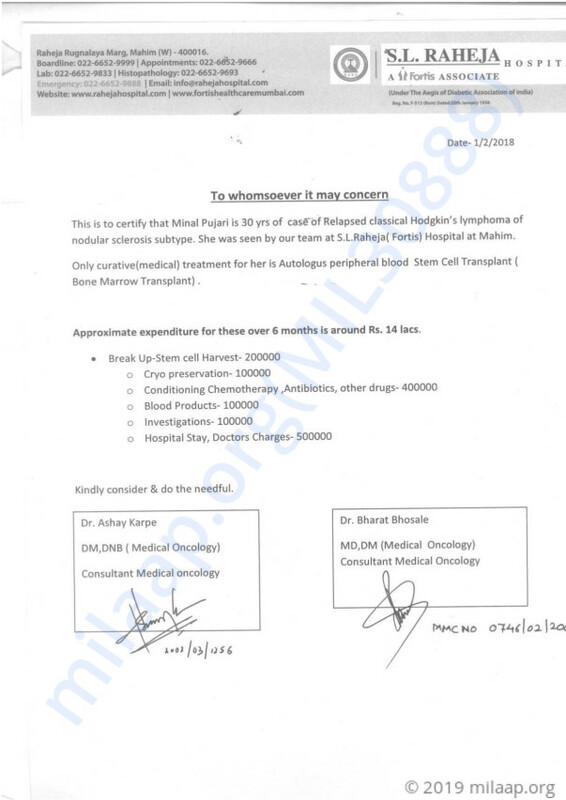 Now, her treatment and transplant will cost around Rs. 14 lakhs and I need to figure out that, how am I going to get that much money without a job? I’m going to give everything I’ve got to save my life partner and we’re going to be reunited with our son. This is my only goal. 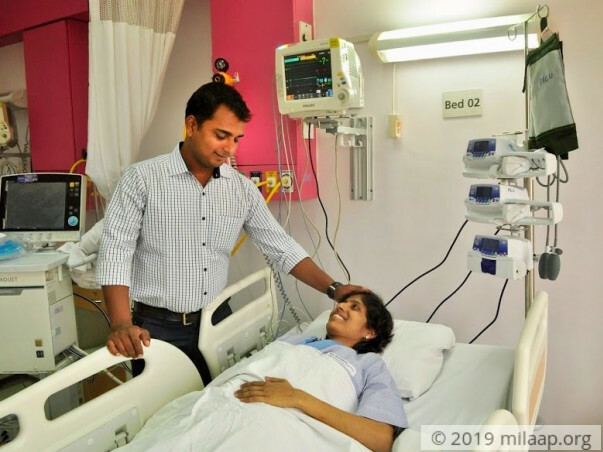 Minal is at home as of now and is undergoing regular tests. She had a fracture and her bone was operated on, two months back. But she is doing well now. Here's an quick update on Minal's health. She successfully underwent her transplant and slowly recovering. Currently, she is undergoing post transplant tests and is under medications. We are hopeful about her recovery. Thank you once again for your support and love. This couldn't have been possible without you. Thank you for your support and love. This couldn't have been possible without you. Minal's Bone Marrow Transplant is yet to start. The doctors have told us they are likely to start the treatment next week. She has already undergone 3 cycles of chemotherapy. All the pre-transplant tests are also done. She is currently at home, prepping for the big day. We all are hoping for her to recover soon and get back to normal.